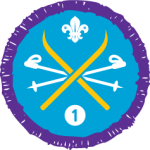 The Snowsports Staged Activity Badge was newly introduced on 26th January 2018. This badge replaces the existing Skiing and Snowboarding Activity Badges. The Snowsports Staged Activity Badge can be achieved from Stage One through to Stage Four. To earn the badge, you must complete all the tasks and requirements within a stage and the previous stages. For example, to earn Stage Two, you must complete all elements of both Stage One and Stage Two. If you have obtained the Scout Association Personal Activity Permit for Snowsports, you can automatically earn this stage of the Snowsports Staged Activity Badge.